The toxic mushroom Amanita muscaria, commonly known as "fly agaric." "Toadstool" redirects here. For other uses, see Toadstool (disambiguation). The standard for the name "mushroom" is the cultivated white button mushroom, Agaricus bisporus; hence the word "mushroom" is most often applied to those fungi (Basidiomycota, Agaricomycetes) that have a stem (stipe), a cap (pileus), and gills (lamellae, sing. lamella) on the underside of the cap. "Mushroom" also describes a variety of other gilled fungi, with or without stems, therefore the term is used to describe the fleshy fruiting bodies of some Ascomycota. These gills produce microscopic spores that help the fungus spread across the ground or its occupant surface. Forms deviating from the standard morphology usually have more specific names, such as "bolete", "puffball", "stinkhorn", and "morel", and gilled mushrooms themselves are often called "agarics" in reference to their similarity to Agaricus or their order Agaricales. By extension, the term "mushroom" can also refer to either the entire fungus when in culture, the thallus (called a mycelium) of species forming the fruiting bodies called mushrooms, or the species itself. Identifying mushrooms requires a basic understanding of their macroscopic structure. Most are Basidiomycetes and gilled. Their spores, called basidiospores, are produced on the gills and fall in a fine rain of powder from under the caps as a result. 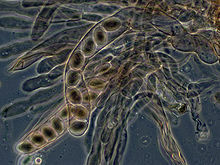 At the microscopic level, the basidiospores are shot off basidia and then fall between the gills in the dead air space. As a result, for most mushrooms, if the cap is cut off and placed gill-side-down overnight, a powdery impression reflecting the shape of the gills (or pores, or spines, etc.) is formed (when the fruit body is sporulating). The color of the powdery print, called a spore print, is used to help classify mushrooms and can help to identify them. Spore print colors include white (most common), brown, black, purple-brown, pink, yellow, and creamy, but almost never blue, green, or red. A mushroom (probably Russula brevipes) parasitized by Hypomyces lactifluorum resulting in a "Lobster mushroom". Typical mushrooms are the fruit bodies of members of the order Agaricales, whose type genus is Agaricus and type species is the field mushroom, Agaricus campestris. However, in modern molecularly defined classifications, not all members of the order Agaricales produce mushroom fruit bodies, and many other gilled fungi, collectively called mushrooms, occur in other orders of the class Agaricomycetes. For example, chanterelles are in the Cantharellales, false chanterelles such as Gomphus are in the Gomphales, milk-cap mushrooms (Lactarius, Lactifluus) and russulas (Russula), as well as Lentinellus, are in the Russulales, while the tough, leathery genera Lentinus and Panus are among the Polyporales, but Neolentinus is in the Gloeophyllales, and the little pin-mushroom genus, Rickenella, along with similar genera, are in the Hymenochaetales. Within the main body of mushrooms, in the Agaricales, are common fungi like the common fairy-ring mushroom, shiitake, enoki, oyster mushrooms, fly agarics and other Amanitas, magic mushrooms like species of Psilocybe, paddy straw mushrooms, shaggy manes, etc. 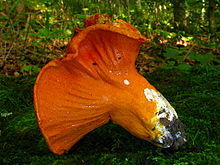 An atypical mushroom is the lobster mushroom, which is a deformed, cooked-lobster-colored parasitized fruitbody of a Russula or Lactarius, colored and deformed by the mycoparasitic Ascomycete Hypomyces lactifluorum. Other mushrooms are not gilled, so the term "mushroom" is loosely used, and giving a full account of their classifications is difficult. Some have pores underneath (and are usually called boletes), others have spines, such as the hedgehog mushroom and other tooth fungi, and so on. "Mushroom" has been used for polypores, puffballs, jelly fungi, coral fungi, bracket fungi, stinkhorns, and cup fungi. Thus, the term is more one of common application to macroscopic fungal fruiting bodies than one having precise taxonomic meaning. Approximately 14,000 species of mushrooms are described. The terms "mushroom" and "toadstool" go back centuries and were never precisely defined, nor was there consensus on application. Between 1400 and 1600 AD, the terms mushrom, mushrum, muscheron, mousheroms, mussheron, or musserouns were used. The term "mushroom" and its variations may have been derived from the French word mousseron in reference to moss (mousse). Delineation between edible and poisonous fungi is not clear-cut, so a "mushroom" may be edible, poisonous, or unpalatable. Cultural or social phobias of mushrooms and fungi may be related. The term "fungophobia" was coined by William Delisle Hay of England, who noted a national superstition or fear of "toadstools". The word "toadstool" has apparent analogies in Dutch padde(n)stoel (toad-stool/chair, mushroom) and German Krötenschwamm (toad-fungus, alt. word for panther cap). 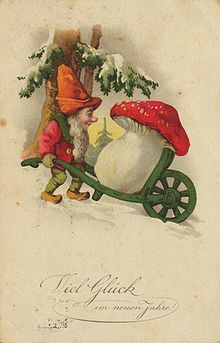 In German folklore and old fairy tales, toads are often depicted sitting on toadstool mushrooms and catching, with their tongues, the flies that are said to be drawn to the Fliegenpilz, a German name for the toadstool, meaning "flies' mushroom". This is how the mushroom got another of its names, Krötenstuhl (a less-used German name for the mushroom), literally translating to "toad-stool". A mushroom develops from a nodule, or pinhead, less than two millimeters in diameter, called a primordium, which is typically found on or near the surface of the substrate. It is formed within the mycelium, the mass of threadlike hyphae that make up the fungus. The primordium enlarges into a roundish structure of interwoven hyphae roughly resembling an egg, called a "button". The button has a cottony roll of mycelium, the universal veil, that surrounds the developing fruit body. As the egg expands, the universal veil ruptures and may remain as a cup, or volva, at the base of the stalk, or as warts or volval patches on the cap. Many mushrooms lack a universal veil, therefore they do not have either a volva or volval patches. Often, a second layer of tissue, the partial veil, covers the bladelike gills that bear spores. As the cap expands, the veil breaks, and remnants of the partial veil may remain as a ring, or annulus, around the middle of the stalk or as fragments hanging from the margin of the cap. The ring may be skirt-like as in some species of Amanita, collar-like as in many species of Lepiota, or merely the faint remnants of a cortina (a partial veil composed of filaments resembling a spiderweb), which is typical of the genus Cortinarius. Mushrooms lacking partial veils do not form an annulus. The stalk (also called the stipe, or stem) may be central and support the cap in the middle, or it may be off-center and/or lateral, as in species of Pleurotus and Panus. 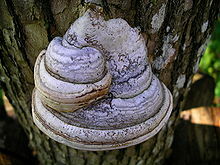 In other mushrooms, a stalk may be absent, as in the polypores that form shelf-like brackets. Puffballs lack a stalk, but may have a supporting base. Other mushrooms, such as truffles, jellies, earthstars, and bird's nests, usually do not have stalks, and a specialized mycological vocabulary exists to describe their parts. The way the gills attach to the top of the stalk is an important feature of mushroom morphology. Mushrooms in the genera Agaricus, Amanita, Lepiota and Pluteus, among others, have free gills that do not extend to the top of the stalk. Others have decurrent gills that extend down the stalk, as in the genera Omphalotus and Pleurotus. There are a great number of variations between the extremes of free and decurrent, collectively called attached gills. Finer distinctions are often made to distinguish the types of attached gills: adnate gills, which adjoin squarely to the stalk; notched gills, which are notched where they join the top of the stalk; adnexed gills, which curve upward to meet the stalk, and so on. 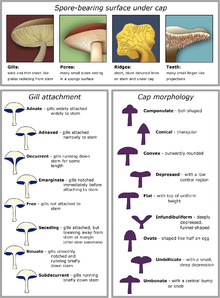 These distinctions between attached gills are sometimes difficult to interpret, since gill attachment may change as the mushroom matures, or with different environmental conditions. A hymenium is a layer of microscopic spore-bearing cells that covers the surface of gills. In the nongilled mushrooms, the hymenium lines the inner surfaces of the tubes of boletes and polypores, or covers the teeth of spine fungi and the branches of corals. In the Ascomycota, spores develop within microscopic elongated, sac-like cells called asci, which typically contain eight spores in each ascus. The Discomycetes, which contain the cup, sponge, brain, and some club-like fungi, develop an exposed layer of asci, as on the inner surfaces of cup fungi or within the pits of morels. The Pyrenomycetes, tiny dark-colored fungi that live on a wide range of substrates including soil, dung, leaf litter, and decaying wood, as well as other fungi, produce minute, flask-shaped structures called perithecia, within which the asci develop. In the Basidiomycetes, usually four spores develop on the tips of thin projections called sterigmata, which extend from club-shaped cells called a basidia. 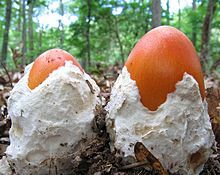 The fertile portion of the Gasteromycetes, called a gleba, may become powdery as in the puffballs or slimy as in the stinkhorns. Interspersed among the asci are threadlike sterile cells called paraphyses. Similar structures called cystidia often occur within the hymenium of the Basidiomycota. Many types of cystidia exist, and assessing their presence, shape, and size is often used to verify the identification of a mushroom. The most important microscopic feature for identification of mushrooms is the spores. Their color, shape, size, attachment, ornamentation, and reaction to chemical tests often can be the crux of an identification. A spore often has a protrusion at one end, called an apiculus, which is the point of attachment to the basidium, termed the apical germ pore, from which the hypha emerges when the spore germinates. Not all mushrooms expand overnight; some grow very slowly and add tissue to their fruitbodies by growing from the edges of the colony or by inserting hyphae. For example, Pleurotus nebrodensis grows slowly, and because of this combined with human collection, it is now critically endangered. Raw brown mushrooms are 92% water, 4% carbohydrates, 2% protein and less than 1% fat. In a 100 gram (3.5 ounce) amount, raw mushrooms provide 22 calories and are a rich source (20% or more of the Daily Value, DV) of B vitamins, such as riboflavin, niacin and pantothenic acid, selenium (37% DV) and copper (25% DV), and a moderate source (10-19% DV) of phosphorus, zinc and potassium (table). They have minimal or no Vitamin C and sodium content. The vitamin D content of a mushroom depends on postharvest handling, in particular the unintended exposure to sunlight. 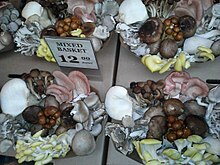 The US Department of Agriculture provided evidence that UV-exposed mushrooms contain substantial amounts of vitamin D. When exposed to ultraviolet (UV) light, even after harvesting, ergosterol in mushrooms is converted to vitamin D2, a process now used intentionally to supply fresh vitamin D mushrooms for the functional food grocery market. In a comprehensive safety assessment of producing vitamin D in fresh mushrooms, researchers showed that artificial UV light technologies were equally effective for vitamin D production as in mushrooms exposed to natural sunlight, and that UV light has a long record of safe use for production of vitamin D in food. Separating edible from poisonous species requires meticulous attention to detail; there is no single trait by which all toxic mushrooms can be identified, nor one by which all edible mushrooms can be identified. People who collect mushrooms for consumption are known as mycophagists, and the act of collecting them for such is known as mushroom hunting, or simply "mushrooming". Even edible mushrooms may produce allergic reactions in susceptible individuals, from a mild asthmatic response to severe anaphylactic shock. Even the cultivated A. bisporus contains small amounts of hydrazines, the most abundant of which is agaritine (a mycotoxin and carcinogen). However, the hydrazines are destroyed by moderate heat when cooking. Many mushroom species produce secondary metabolites that can be toxic, mind-altering, antibiotic, antiviral, or bioluminescent. Although there are only a small number of deadly species, several others can cause particularly severe and unpleasant symptoms. Toxicity likely plays a role in protecting the function of the basidiocarp: the mycelium has expended considerable energy and protoplasmic material to develop a structure to efficiently distribute its spores. One defense against consumption and premature destruction is the evolution of chemicals that render the mushroom inedible, either causing the consumer to vomit the meal (see emetics), or to learn to avoid consumption altogether. In addition, due to the propensity of mushrooms to absorb heavy metals, including those that are radioactive, European mushrooms may, as late as 2008, include toxicity from the 1986 Chernobyl disaster and continue to be studied. Mushrooms with psychoactive properties have long played a role in various native medicine traditions in cultures all around the world. They have been used as sacrament in rituals aimed at mental and physical healing, and to facilitate visionary states. One such ritual is the velada ceremony. A practitioner of traditional mushroom use is the shaman or curandera (priest-healer). Psilocybin mushrooms possess psychedelic properties. Commonly known as "magic mushrooms" or "'shrooms", they are openly available in smart shops in many parts of the world, or on the black market in those countries that have outlawed their sale. Psilocybin mushrooms have been reported as facilitating profound and life-changing insights often described as mystical experiences. Recent scientific work has supported these claims, as well as the long-lasting effects of such induced spiritual experiences. There are over 100 psychoactive mushroom species of genus Psilocybe native to regions all around the world. Psilocybin, a naturally occurring chemical in certain psychedelic mushrooms such as Psilocybe cubensis, is being studied for its ability to help people suffering from psychological disorders, such as obsessive–compulsive disorder. Minute amounts have been reported to stop cluster and migraine headaches. A double-blind study, done by the Johns Hopkins Hospital, showed psychedelic mushrooms could provide people an experience with substantial personal meaning and spiritual significance. In the study, one third of the subjects reported ingestion of psychedelic mushrooms was the single most spiritually significant event of their lives. Over two-thirds reported it among their five most meaningful and spiritually significant events. On the other hand, one-third of the subjects reported extreme anxiety. However, the anxiety went away after a short period of time. Psilocybin mushrooms have also shown to be successful in treating addiction, specifically with alcohol and cigarettes. A few species in the genus Amanita, most recognizably A. muscaria, but also A. pantherina, among others, contain the psychoactive compound muscimol. The muscimol-containing chemotaxonomic group of Amanitas contains no amatoxins or phallotoxins, and as such are not hepatoxic, though if not properly cured will be non-lethally neurotoxic due to the presence of ibotenic acid. 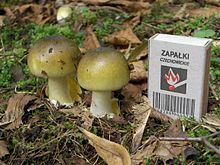 The Amanita intoxication is similar to Z-drugs in that it includes CNS depressant and sedative-hypnotic effects, but also dissociation and delirium in high doses. Some mushrooms are used or studied as possible treatments for diseases, particularly their extracts, including polysaccharides, glycoproteins and proteoglycans. In some countries, extracts of polysaccharide-K, schizophyllan, polysaccharide peptide, or lentinan are government-registered adjuvant cancer therapies, even though clinical evidence of efficacy in humans has not been confirmed. Historically in traditional Chinese medicine, mushrooms are believed to have medicinal value, although there is no evidence for such uses. Mushrooms can be used for dyeing wool and other natural fibers. The chromophores of mushroom dyes are organic compounds and produce strong and vivid colors, and all colors of the spectrum can be achieved with mushroom dyes. Before the invention of synthetic dyes, mushrooms were the source of many textile dyes. Mushrooms and other fungi play a role in the development of new biological remediation techniques (e.g., using mycorrhizae to spur plant growth) and filtration technologies (e.g. using fungi to lower bacterial levels in contaminated water). ^ Dickinson C, Lucas J (1982). VNR Color Dictionary of Mushrooms. Van Nostrand Reinhold. pp. 9–11. ISBN 978-0-442-21998-7. ^ Ammirati et al., 1985, pp. 40–41. ^ Volk T. (2001). "Hypomyces lactifluorum, the lobster mushroom". 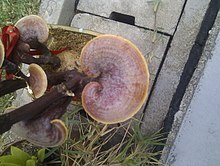 Fungus of the Month. University of Wisconsin-La Crosse, Department of Biology. Retrieved 2008-10-13. ^ Miles PG, Chang ST (2004). Mushrooms: Cultivation, Nutritional Value, Medicinal Effect, and Environmental Impact. Boca Raton, Florida: CRC Press. ISBN 978-0-8493-1043-0. ^ Harding, Patrick (2008). Mushroom Miscellany. HarperCollins. p. 149. ISBN 978-0-00-728464-1. ^ Ramsbottom J. (1954). Mushrooms & Toadstools: a study of the activities of fungi. London: Collins. ^ Hay, William Deslisle (1887). An Elementary Text-Book of British Fungi. London, S. Sonnenschein, Lowrey. pp. 6–7. ^ Arora, David (1986). Mushrooms Demystified, A Comprehensive Guide to the Fleshy Fungi. Ten Speed Press. pp. 1–3. ISBN 978-0-89815-169-5. ^ Hunter, Jessica. "The Mushroom Hunt". Synergy Magazine. Retrieved 2012-01-02. ^ Stuntz et al., 1978, pp. 12–13. ^ Stuntz et al., 1978, pp. 28–29. ^ a b c Ammirati et al., 1985, pp. 25–34. ^ Nelson N. (2006-08-13). "Parasola plicatilis". Archived from the original on 2013-01-02. Retrieved 2008-10-13. ^ Venturella, G. 2006. Pleurotus nebrodensis. In: IUCN. 2009. IUCN Red List of Threatened Species. Version 2009.1. http://www.iucnredlist.org/apps/redlist/details/full/61597/0 Downloaded on 15 October 2009. ^ Dodge, S.R. "And the Humongous Fungus Race Continues". US Forest Service: Pacific Northwest Research Station. Retrieved 2011-02-28. ^ Tsukamoto, Shunsuke; Kudoh, Hisashi; Ohga, Shoji; Yamamoto, Kunihiro; Akiyama, Hidenori (2005-06-17). "Development of an Automatic Electrical Stimulator for Mushroom Sawdust Bottle". IEEE Xplore – Development of an Automatic Electrical Stimulator for Mushroom Sawdust Bottle. Ieeexplore.ieee.org. pp. 1437–1440. doi:10.1109/PPC.2005.300675. ISBN 978-0-7803-9189-5. Retrieved 2014-01-24. ^ Haytowitz DB (2009). "Vitamin D in mushrooms" (PDF). Nutrient Data Laboratory, US Department of Agriculture. Retrieved 16 April 2018. ^ Kalaras, M. D.; Beelman, R. B.; Elias, R. J. (2012). "Effects of postharvest pulsed UV light treatment of white button mushrooms (Agaricus bisporus) on vitamin D2 content and quality attributes". Journal of Agricultural and Food Chemistry. 60 (1): 220–5. doi:10.1021/jf203825e. PMID 22132934. ^ Koyyalamudi SR, Jeong SC, Song CH, Cho KY, Pang G (2009). "Vitamin D2 formation and bioavailability from Agaricus bisporus button mushrooms treated with ultraviolet irradiation" (PDF). Journal of Agricultural and Food Chemistry. 57 (8): 3351–5. doi:10.1021/jf803908q. PMID 19281276. Archived from the original (PDF) on 2011-07-22. ^ a b Simon, R. R.; Borzelleca, J. F.; Deluca, H. F.; Weaver, C. M. (2013). "Safety assessment of the post-harvest treatment of button mushrooms (Agaricus bisporus) using ultraviolet light". Food and Chemical Toxicology. 56: 278–89. doi:10.1016/j.fct.2013.02.009. PMID 23485617. ^ Haas EM, James P (2009). More Vegetables, Please! : Delicious Recipes for Eating Healthy Foods Each & Every Day. Oakland, California: New Harbinger Publications. p. 22. ISBN 978-1-57224-590-7. ^ "Production of Cultivated Edible Mushroom in China With Emphasis on Lentinula edodes - isms.biz". isms.biz. Retrieved 2017-01-25. ^ Hall et al., 2003, p. 25. ^ "Poland: The world's largest mushroom exporter". Fresh Plaza. 8 April 2015. Retrieved 23 September 2016. ^ Metzler V, Metzler S (1992). Texas Mushrooms: a Field Guide. Austin, Texas: University of Texas Press. p. 37. ISBN 978-0-292-75125-5. Retrieved 2010-08-04. ^ Hall et al., 2003, pp. 22–24. ^ Ammirati et al., 1985, pp. 81–83. ^ Schulzova, V; Hajslova, J; Peroutka, R; Hlavasek, J; Gry, J; Andersson, H.C. (2009). "Agaritine content of 53 Agaricus species collected from nature". Food Additives & Contaminants: Part A. 26 (1): 82–93. doi:10.1080/02652030802039903. PMID 19680875. ^ Siegered, AA, ed. (January 1998). "Spore Prints #338". Bulletin of the Puget Sound Mycological Society. Retrieved 2010-07-04. ^ "Belarus exports radioactive mushrooms, April 2008". Freshplaza.com. Retrieved 2014-01-24. ^ Hudler GW. (2000). Magical Mushrooms, Mischievous Molds. Princeton, New Jersey: Princeton University Press. p. 175. ISBN 978-0-691-07016-2. Retrieved 2010-08-04. ^ Griffiths R, Richards W, Johnson M, McCann U, Jesse R (2008). "Mystical-type experiences occasioned by psilocybin mediate the attribution of personal meaning and spiritual significance 14 months later". Journal of Psychopharmacology (Oxford, England). 22 (6): 621–32. doi:10.1177/0269881108094300. PMC 3050654. PMID 18593735. ^ Guzmán G, Allen JW, Gartz J (1998). "A worldwide geographical distribution of the neurotropic fungi, an analysis and discussion" (PDF). Annali del Museo Civico di Rovereto. 14: 207. ^ Sewell RA, Halpern JH, Pope HG (2006). "Response of cluster headache to psilocybin and LSD". Neurology. 66 (12): 1920–22. doi:10.1212/01.wnl.0000219761.05466.43. PMID 16801660. ^ Griffiths RR, Richards WA, McCann U, Jesse R (2006). "Psilocybin can occasion mystical-type experiences having substantial and sustained personal meaning and spiritual significance". Psychopharmacology. 187 (3): 268–83. doi:10.1007/s00213-006-0457-5. PMID 16826400. ^ Borchers, A. T.; Krishnamurthy, A; Keen, C. L.; Meyers, F. J.; Gershwin, M. E. (2008). "The immunobiology of mushrooms". Experimental Biology and Medicine. 233 (3): 259–76. CiteSeerX 10.1.1.546.3528. doi:10.3181/0708-MR-227. PMID 18296732. ^ "Coriolus Versicolor". American Cancer Society. 1 November 2008. Archived from the original on 25 June 2010. Retrieved 2011-03-01. ^ Borchers AT, Krishnamurthy A, Keen CL, Meyers FJ, Gershwin ME (2008). "The immunobiology of mushrooms". Experimental Biology and Medicine. 233 (3): 259–76. CiteSeerX 10.1.1.546.3528. doi:10.3181/0708-MR-227. PMID 18296732. 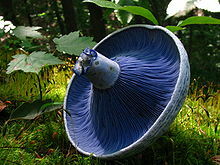 ^ "Mushrooms in cancer treatment". Cancer Research UK. 30 January 2015. Retrieved 15 November 2017. ^ Khan, M. A.; Tania, M; Liu, R; Rahman, M. M. (2013). "Hericium erinaceus: An edible mushroom with medicinal values". Journal of Complementary and Integrative Medicine. 10. doi:10.1515/jcim-2013-0001. PMID 23735479. ^ Kulshreshtha S, Mathur N, Bhatnagar P (2014). "Mushroom as a product and their role in mycoremediation". AMB Express. 4: 29. doi:10.1186/s13568-014-0029-8. PMC 4052754. PMID 24949264. Ammirati JF, Traquair JA, Horgen PA (1985). Poisonous Mushrooms of Canada: Including other Inedible Fungi. Markham, Ontario: Fitzhenry & Whiteside in cooperation with Agriculture Canada and the Canadian Government Publishing Centre, Supply and Services Canada. ISBN 978-0-88902-977-4. Hall IR, Stephenson SL, Buchanan PK, Yun W, Cole AL (2003). Edible and Poisonous Mushrooms of the World. Portland, Oregon: Timber Press. ISBN 978-0-88192-586-9. Stuntz DE, Largent DL, Thiers HD, Johnson DJ, Watling R (1978). How to Identify Mushrooms to Genus I. Eureka, California: Mad River Press. ISBN 978-0-916422-00-4. Look up mushroom in Wiktionary, the free dictionary. Wikimedia Commons has media related to Mushrooms. "Mushroom" . Encyclopædia Britannica. 19 (11th ed.). 1911. pp. 70–72. "Toadstool" . Encyclopædia Britannica. 26 (11th ed.). 1911. p. 1035.